To avoid dead spots of grass in the spring, make sure that you remove toys, bicycles, yard ornaments, and anything else lying on your lawn. If you don’t, the grass sitting dormant beneath the items may not recover even with aggressive treatment once the snow melts. People walking across the lawn in the winter can also cause unwanted dead spots in the spring. It might not feel like you’re doing damage to your lawn when you’re walking on snow and ice, but wearing heavy boots is like stomping the grass to death. The best way to avoid this is to clear away snow and ice around your house so people have a safe path for walking. This will also help them avoid the temptation of cutting across the lawn while wearing their winter boots. Be sure to pick up any stray leaves that fall from your trees so they don’t rot in the snow or fall deep enough to leave a spot on the lawn in the spring. If you haven’t done so already, wrap young plants and trees with burlap or a small blanket to prevent damage from snow and ice. Winterize your irrigation system and sprinklers to ensure they will work properly in the spring. It’s also important to drain all water from hoses, wind them properly, and store them in a place where they won’t be exposed to cracking from freezing temperatures. 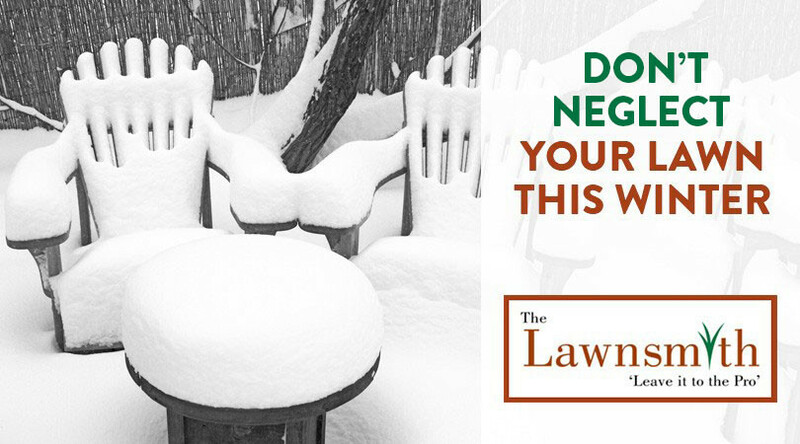 Remember that The Lawnsmith offers services all year long. In the winter, we’re available for snow plowing and roof raking as well as meeting with you to plan your spring, summer, or fall landscape project. Just let us know how we can help.